Today I'm going to finish the instructions for the sofa table that I just built, so bear with me if you have zero interest in constructing furniture. In the interest of keepin' it real, I don't have crazy amounts of interest myself; I just like to save money! I also look at building things like I'd look at a giant, 3D puzzle. It sounds overwhelming before you start, but it's just a matter of taking it one step at a time. If you've never given it a try you should consider it. If you're looking for part 1 of these instructions, go here. If you recall, when we last saw our heroine at the end of part 1, the bones of our project still wobbled from side to side a bit. 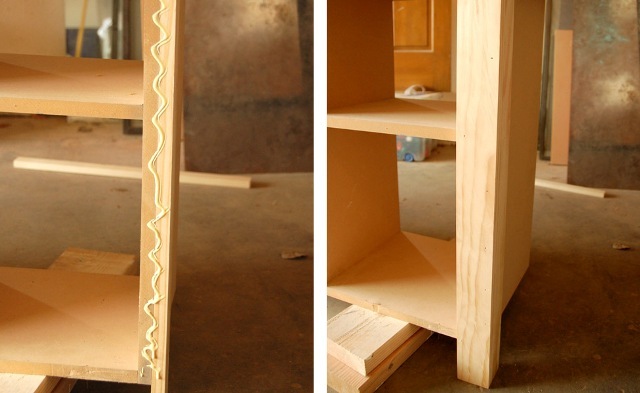 This is because part 2, the trim, is what is actually going to hold the table together as a solid piece. Go around the table, repeating this step for the other three legs. Aren't you glad you sprang for the boards with the sharp corners? 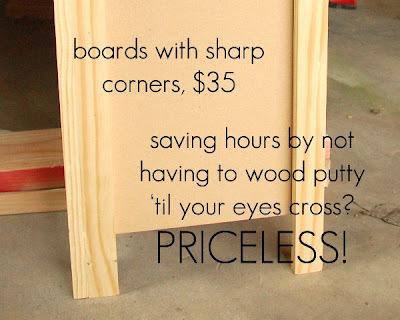 It will save you hours with the wood putty, I promise. It's really tricky and time consuming to fill those rounded edges and make it look smooth like a solid leg, plus it requires gobs of putty. Gobs!! 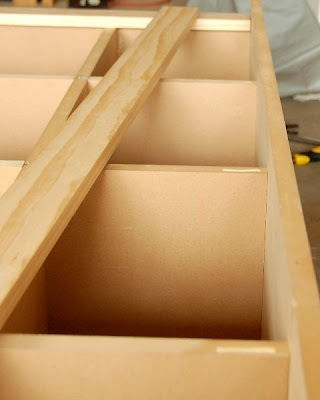 Important Note: Apply glue to every surface where two pieces of wood will be touching -- don't skip this as these pieces of trim are going to be doing the majority of the stabilizing and we don't want wiggly tables. 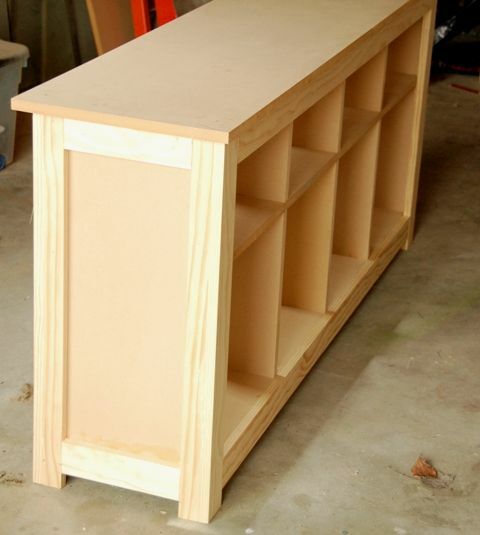 Glue the tops of the cubby dividers, the sides of the 1x3 trim you just attached... you get the idea. Glue it, baby. Repeat on the back side of the table. 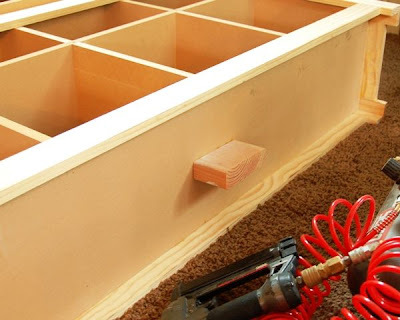 Optional plan change: You can buy a thin piece of plywood or masonite and nail it to the back side if you want a solid back, but otherwise do not skip trimming out both sides of the table. Stabilizing, remember? 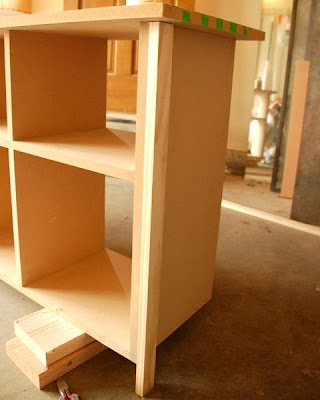 Step 3 - Attach the 9" pieces of 1x3 to the top and bottom of both sides of the table. Make sure to line up the bottom pieces with the other trim along the bottom to create a clean line. Step 4 (optional, but recommended) - This is another just in case step, but I think it's wise. Cut a random piece of scrap to 3" (the length from the bottom of the table to the ends of the feet) and add a middle supporting foot. You won't see it, but it will ensure that your table won't sag over time. And there you have it, a completed sofa table. Inspiration table cost: $149-$169, depending on your finish. So that leaves at least $80 for my finishing budget just to break even (not including the ridiculous amount it would have cost me in gas). And since I'm not going to cover the table in gold leaf, I think I'm going to come out way ahead when all is said and done. Score! NOW who wants to make their own table?? Go from the posts or download the directions. Great project-- I'm new to your blog and am looking forward to more reads. BEAUTIFUL! I am uber-impressed. Can't wait to see how you finish it!! Wow am I ever impressed. I don't think I could do that but would love to try. I am not that skilled. But I want one. Awesome sofa table! I love it! I really like the Hemnes collection at IKEA! You have totally encouraged me to try this!! Thanks for sharing!!! This is a really awesome tutorial! I've been lamenting over the costs of tables for my entry way and this may be what I end up doing instead! So glad I happened on your blog via Pinterest! this is so impressive and it came out so beautifully! it could come from a crate & barrel catalogue! bravo and thanks for sharing! I am also new to your blog! I love it. Is the table sturdy? Where did you pick up those baskets? Thanks for putting this up! Looks great!!! Can you tell us the finished dimensions? I think I figured out the top is 62 wide and 15 deep, and the shelves underneath are 12" deep. But the finished height? (and correct me if I estimated incorrectly). Thank you SO much for taking the time to post these instructions with all the great photos. 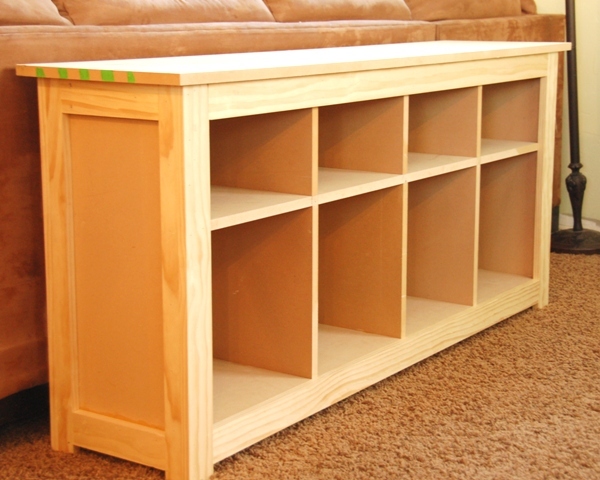 I am going to attempt this project with the help of my wonderful uncle who is great at things like this. I noticed there was a PDF file mentioned but I didn't see where to download this. Can anybody help me find this? AWE-MAZING! Good job! Can I pay you to make one for me. LOL! I'm kidding! Has anyone determined the finished dimensions? Has anyone tried this with plywood?